Can you think of anything more wonderful than sitting outside on a warm summer evening, sipping chilled white wine or beer, and eating these gorgeous little treats? I qualify them as dessert but they’re savory enough to join a dinner spread as a side dish. Heat grill or grill pan to medium-high heat. If using grill pan, brush with vegetable oil. Split the apricots in half lengthwise, discarding the pit. Grill flesh-side down for 3-5 minutes or until grill-marks appear and the fruit softens slightly. 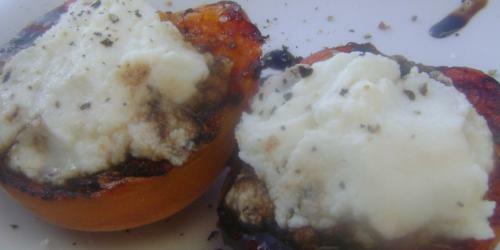 Drizzle the apricots' grilled side lightly with the balsamic vinegar. Top each one with a dollop of ricotta and freshly-cracked black pepper. I had the pleasure last summer of having Gabi make this for me. It was one of the culinary highlights of my life—just saying folks. . .
Howdy. I discovered your web journal utilizing msn. This is an extremely elegantly composed article. I’ll make certain to bookmark it and return to peruse a greater amount of your helpful information. A debt of gratitude is in order for the post. I’ll certainly return.